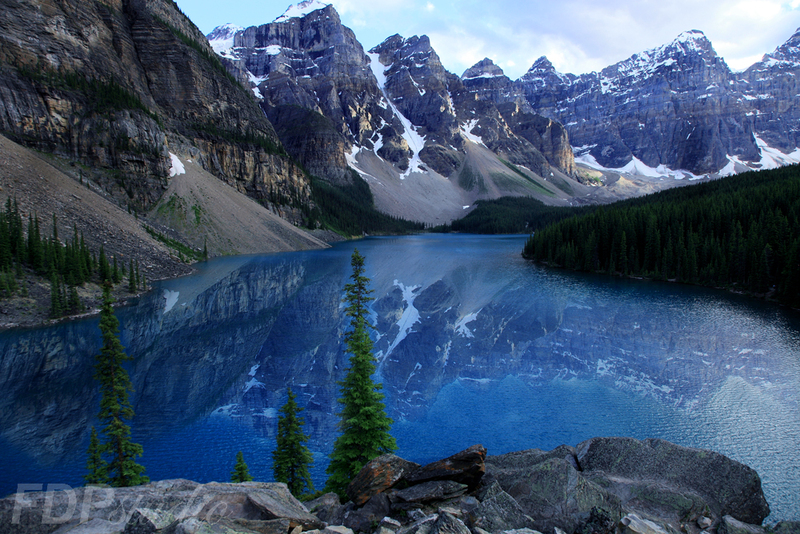 Moraine Lake is a glacially-fed lake in National Park 14 (8.7 mi) outside the Village of Lake Louise. There are several walking and hiking trails in the area; however, sometimes they are restricted due to Grizzly bear activity. Parks Canada updates this information constantly. 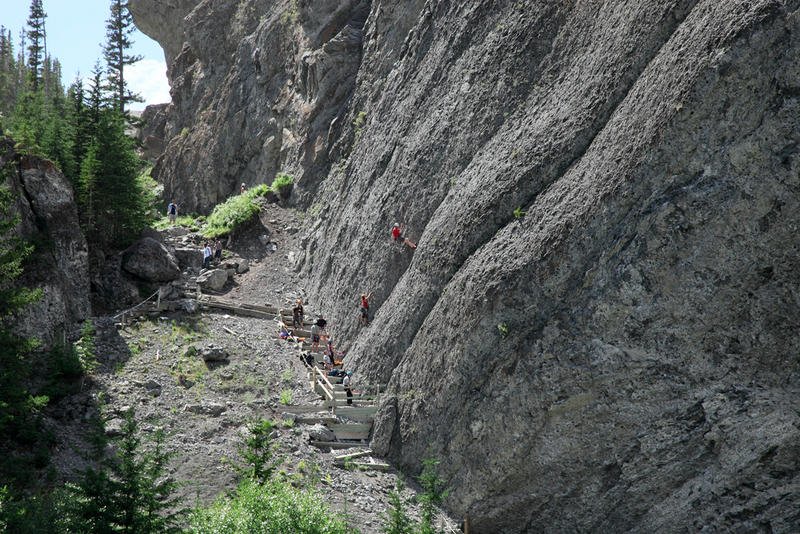 The easiest of the trail is the on most people take and it is also the most photographed, it is the Rockpile Trail (photo above) just around the lake about 300 meters long. The view at the top from the rocks is the one most photographed and was featured on the back of the Canadian $20 bill in 1969 and 1979 issues. Along the same trailhead there is the hike trail for Consolation Lakes, about km. At the bottom (photo on the right is at the shore), near the shore of Moraine Lake there 5 more trails starting from the canoe dock. The Lake Louise and Yoho map provides information on these trails. 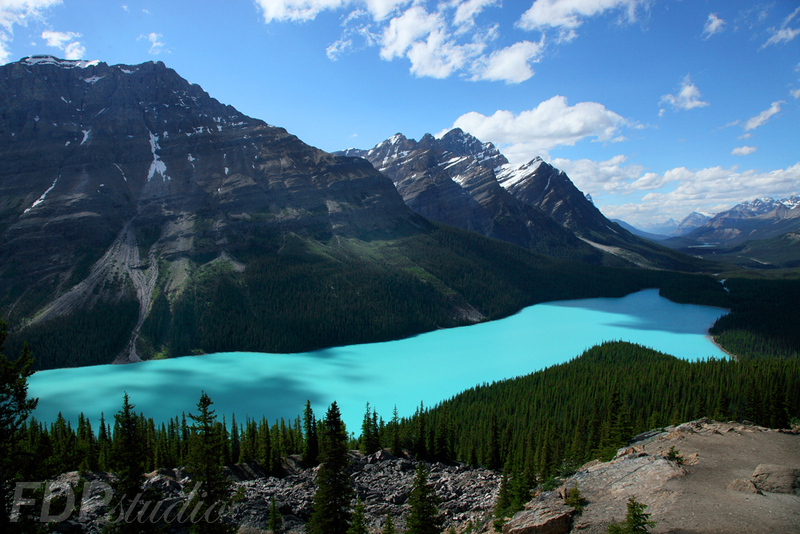 Peyto Lake (pea-toe) is a glacier fed lake located in Banff National Park (photo on the right). 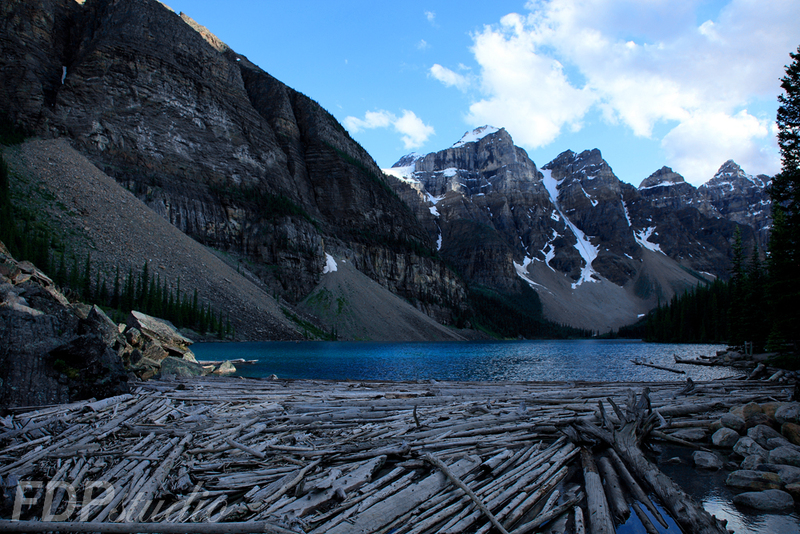 The lake itself is easily accessed from the Icefields Parkway (HWY 93 and 40 km from Lake Louise). It was named for Bill Peyto trail guide in the Banff area in the early days. The lake is formed in a valley and its turquoise color is formed by the glacier rock flour flow into the lake. The lake is fed by Peyto Creek which drains water from the Caldron lake and Peyto glacier and flows into Mistaya River. The area is a very popular tourist attraction and the lake is best seen from the top at the Bow Summit. The lake is at an elevation of 1,860 m (6,100 ft). Canmore, AB is located in the Bow Valley just east of Banff National Park and about 100km west of Calgary, AB and immediately north of Kananaskis country. 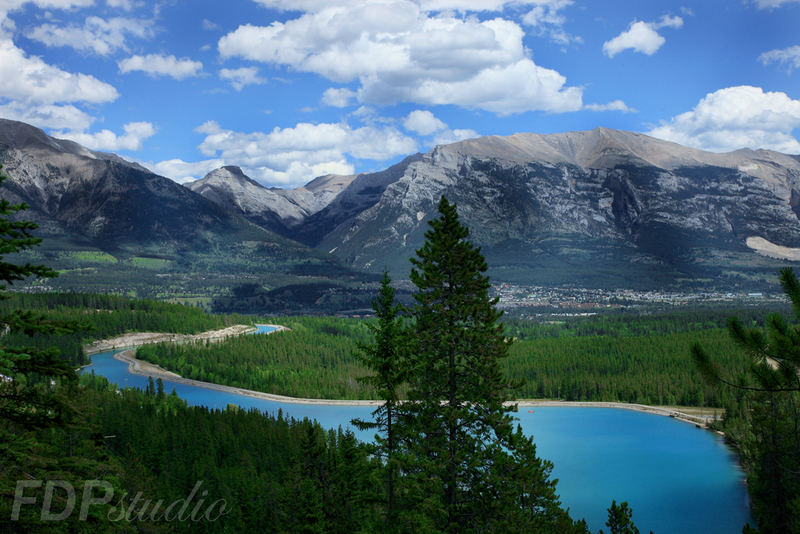 The town lies in the Bow Valley named as such for the Bow River that passes through. Mountains visible from the town site are Three Sisters, Mount Lady McDonald, Mount Lawrence Grassi and Grotto Mountain. Canmore was officially named by CP Rail's director Donald Smith in 1884 and in 1886 Queen Victoria granted a coal mining charter to the town, and the No. 1 mine was opened in 1887. The coal mining industry in Canmore boomed well into the 20th century. In 1965, with a population of 2,000, Canmore was incorporated as a town. By the 1970s the market for coal was diminished, and in 1979 Canmore Mines Ltd. ceased operations. Canmore is a wildlife corridor allowing animals such as bears, cougar, wolves, and elk to move between habitat patches, where they can find food, escape predators, breed, give birth, and establish territories. The town centre surrounds 8th St or "Main Street" and has some of the oldest architecture in town; however, now the street is home to many local shops, restaurants and galleries as well as the Old Bus ice cream place visited by many in the summer. A series of hiking, mountain biking, equestrian, and paved trails traverse the Canmore area. Major trail systems are located on the Benchlands of Mount Lady Macdonald, at the Nordic Centre and along the north slope of Mount Lawrence Grassi. 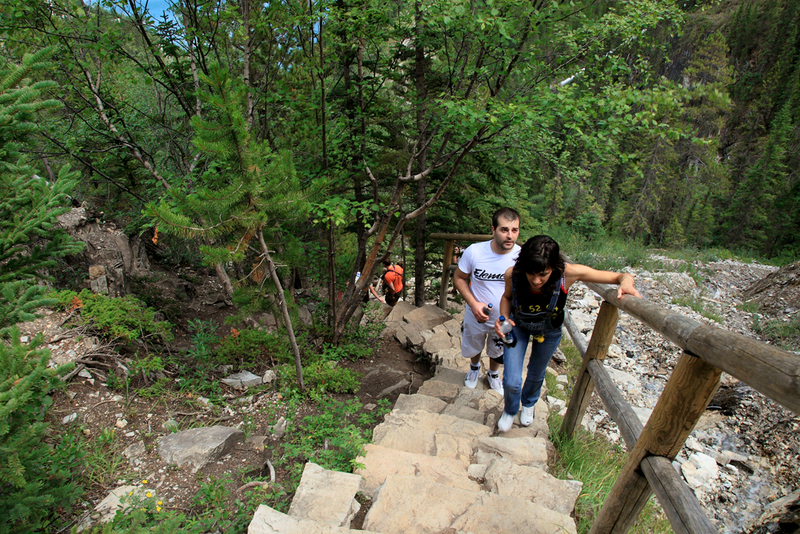 Many of these trails, and others around the community, are located within the Bow Valley Wildlife Provincial Park and Kananaskis country. Grassi Lakes hike trail, one the most popular hikes when visiting Canmore is right after the Nordic Centre in Canmore, named after Lawrence Grassi, an italian miner who immigrated to Canada in 1912. Lawrence Grassi became a well respected climbing guide and build many trails in the area including the one to Grassi Lakes. The trail is a 4km hike and offers an easy route and a more difficult route. The more difficult route is not that difficult actually it is the sames as the easy one; however, at the end there steep stone stairs you have to get through. 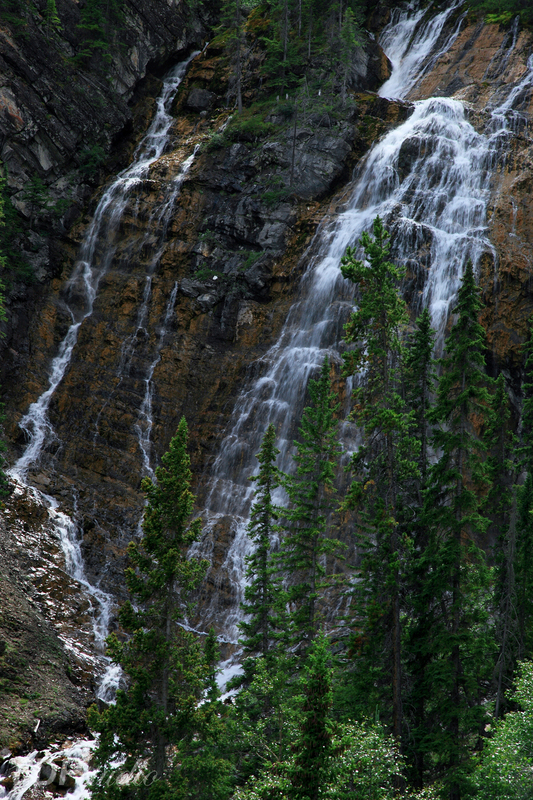 The more difficult trail offers a great view of the Town of Canmore and also a close up view of the waterfall, which is right before you reach the lakes area. 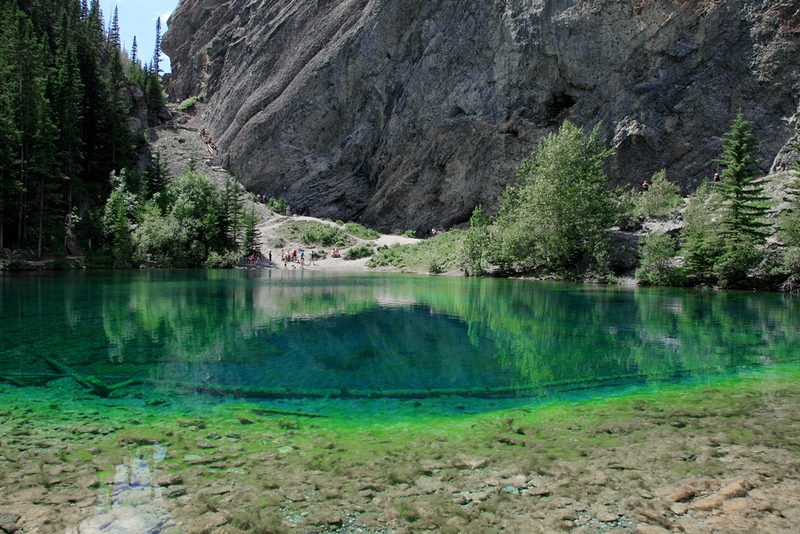 The upper and lower lakes have an amazing turquoise color and clear water. The area is home to many rock climbers and could get pretty busy during the long weekends. Once you leave the Grassi Lakes parking lot, the dirt road to the left takes to Spray Lakes. The Spray Lakes were a string of lakes formed along the Spray River. With the damming of the river, the lakes were united in the Spray Lakes Reservoir. It lies between the Goat Range and Three Sisters ridge. The lake is followed by hwy 742 (dirt road). The lake lies in the recreational area of Kananaskis country and defines the eastern edge of Spray Valley Provincial Park. The length of the lake is 14.8km (9.2mi).If you continue driving on hwy 742, you will connect with hwy 740 in Kananaskis country which will also connect you back with Transcanada Highway. Make sure you have maps if you have never been there. This dirt road drive is pretty dangerous in the winter and is subject to avalanches. 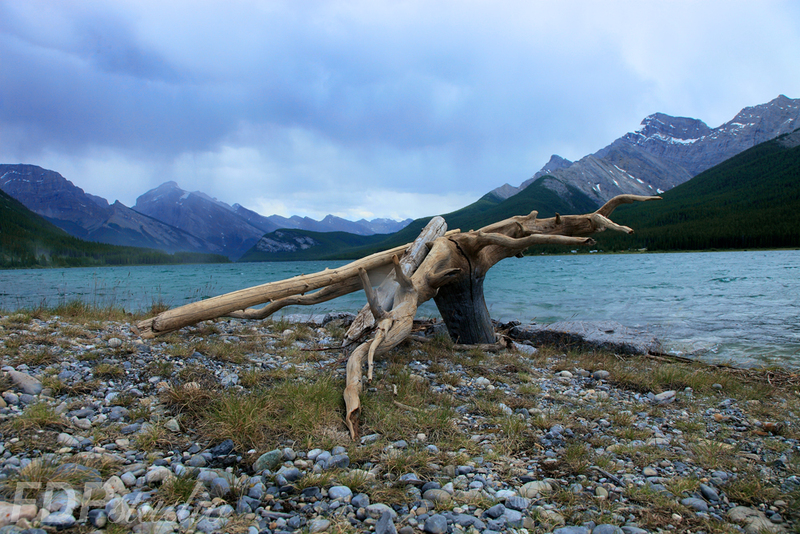 Kananaskis country is very scenic area and it has many campgrounds and recreational areas. 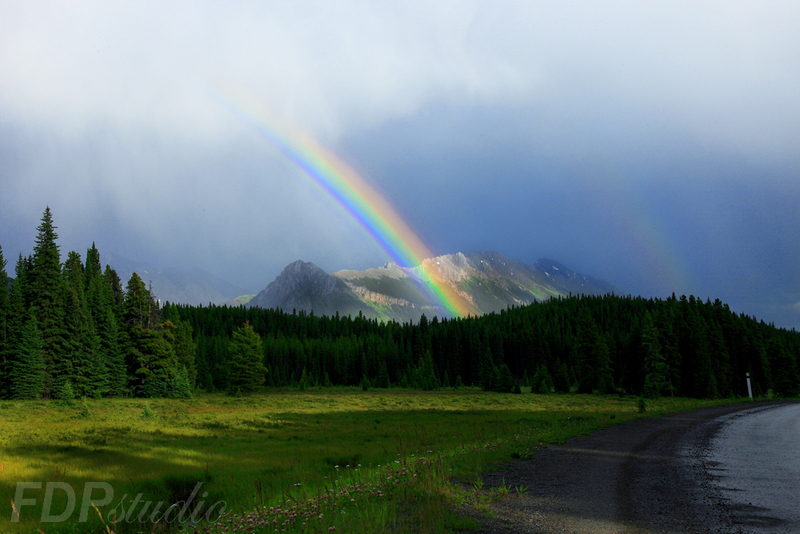 The photo with the double rainbow was taken right after a rain storm we passed through on hwy 40 in Kananaskis country.